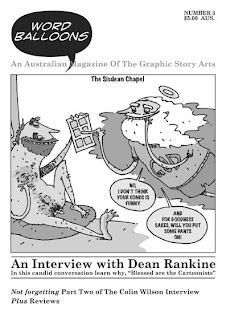 An interview with Dean Rankine. Dean Rankine is a comic creator who pushes the envelope in a number of directions simultaneously. His art style, which for want of a better word, could be said to be ‘extreme cartooning’, pushes form and anatomy to its limits. His themes also take him into contentious areas. His children’s strips often see him deal with such ‘gross themes’ as the various bodily functions – areas which delight many children, but dismay many adults. And then there are his Christian comics...a statement that has probably sent most readers moving forward to the next interview. It must be said that this is not a genre that has produced any great works in the medium in the past, nor are there huge prospects of it occurring in the future. Yet Dean’s strips have appeal thanks to his very individual adaptations. There is some-thing about a Rankinesque track-suited Jesus talking to a guy in a footy jumper and beanie about daisies that works for me. But Dean’s qualities for an interview are more than his unusual art and stories. Whilst he may not make a total living from his work he still makes a partial living as a cartoonist working for one of those hidden areas of comic production: children’s magazines. PB: You’ve ploughed a dual career as a cartoonist and social worker. Could you talk through what led you to both? DR: I initially did an art and design course in 1989-90, then I started freelancing. Always got bits and pieces of work but never enough to survive on. Initially I was working part-time in a library, but I decided that I wanted to do something that was more meaningful. So I started working for the Salvos as a youth worker, then a social worker, and now I work part-time at a needle and syringe programme, driving around at night handing out clean injecting equipment. PB: What led you to try and become a cartoonist? PB: Did you draw comics as a kid or youth? DR: Yes, although I don’t recall finishing many. I was big on drawing superhero parodies. I remember drawing a comic about a superhero termite and another one called Plastic Pig about a pig who was, you know, plastic. [Laughs.] If you look at my stuff now I obviously haven’t moved on very much. To an extent I have reached the goal of being a professional cartoonist, but it doesn’t support me totally financially, and I can’t see that happening in the near future. PB: But it sounds as if you’re perfectly happy to have the social work job. It’s not like it’s a job that you hate. PB: A lot of your kids’ cartoons concentrate on what you could call ‘gross themes’, as with your characters Grossgirl and Boogerboy. This is clearly a recognisable trend in kids’ books. So how much of your interest in it is self-generated and how much is trying to tap into the market? DR: A bit of both, but primarily it’s because that’s what I find funny. I like the sort of humour where you start to laugh, then catch yourself and think “I shouldn’t really be laughing”. [Laughs.] But I do want this stuff to be published, so I am aware of making it marketable. PB: There’s a strong interest in social justice in your faith, isn’t there? PB: Which is an element you don’t tend to associate with the more evangelical side of Christianity. You do describe yourself as ‘born again’ don’t you? PB: Which, again, is a style of faith generally perceived as being from the fundamentalist side and holding to a strict interpretation of the Bible; something which you clearly are not that concerned with given that you are happy to portray Jesus in a ‘No Nukes’ t-shirt and set the Last Supper in McDonalds. DR: Gee, er, I don’t know…it’s hard…I mean the biblical narrative of the life of Jesus isn’t written in a conventional, lineal, non-fictional way. I guess I believe in the ‘vibe’, but I can’t say whether I take all the Bible literally or not. I think it’s essential that we look at the life of Jesus and his teachings in a modern setting. You need to be able to find some meaning in it for our lives today. PB: But there are certainly many people out there who believe that, whilst it should perhaps be applied to today, it shouldn’t be clothed in the look of today. PB: The most stringent criticism of your work has come from fundamental Christians. In particular, one website from the US. Some of the more memorable comments include: “made me physically nauseated”; “To put a ‘style’ or spin on God is to re-make Him into our pre-conceived image instead of the true image as revealed in Scripture. The Bible calls that idolatry.”; “There is true awe about Christ so where is the reverence in this art.”. DR: It’s ironic because the story that they highlighted was one of my tamer healing stories. PB: I think it was more the depiction of Jesus that they objected to. You stated at the time that you felt both shocked and hurt by the attack. And even more so that it should come from Christians. DR: But I was and I still am. Yes, it’s set in modern times, and yes, I have a quirky drawing style, but I didn’t feel that it pushed the boundaries so much to provoke that amount of vehement criticism. PB: It’s hard to know if they could have reacted much worse. I guess I just thought that if you were going to go down that line you would have been prepared for some ‘slings and arrows’. The rest of the interview can be found in Word Balloons 3. An interview with Colin Wilson, Part II. Conducted by Philip Bentley, May & June 2003, January 2004 and updated before publication. In the initial instalment we firstly dealt with Colin’s youth in New Zealand, his involvement with the seminal New Zealand comic Strips , and how he became interested in French comics. After his move to Europe in 1980, we followed his peripatetic path from London to Paris to Amsterdam to Brussels, and watched his career grow from drawing Judge Dredd for 2000AD, to producing his own comic series “Dans L'Ombre du Soleil” [Into the Shadow of the Sun] for Glenat, and then his big break being offered “La Jeunesse de Blueberry” [The Youth of Blueberry] a spin-off of one of France’s most popular comic characters, Lt Blueberry. In this installment we cover the highs and lows of working on an iconic title, the reasons for his move to Australia in the mid 1990s and how he has combined working on comics for four separate markets since then: France, UK, Italy and US. PB: Despite your stated preference for working in the French market, over the past few years you have worked on two series for DC or its affiliates: The Losers 26-28 in 2005, and then in 2006 the five part Battler Britton [and at the time of printing is at work on a Star Wars story for Dark Horse]. So what has changed? CW: Well, I’m still happier in the French market, but having seen what the competition is like there during three months in Europe, early in 2006, I’ll take the work where I can find it. With so much material being published in Europe, it is now very hard to launch and sustain a successful series there. And unless you are selling big numbers, the publishers will happily let a title drop because they are always looking for the next big thing. It is also ironic that by sticking with the work-for-hire model the US market actually pays better than the French. PB: I assume that the fact that both these comics are written by Britons has something to do with their appeal for you? CW: Yes, and also that they are not mainstream comics. PB: So how come you were asked to do them? CW: On The Losers, the regular artist, Jock, was doing both pencils and inks, and I imagine he needed the occasional break. So they have used other artists to do the occasional story-arcs within the overall framework of the series. My name probably came up because of my previous connection with the writer, Andy Diggle. We had worked together when Andy was the editor of 2000AD and have talked about doing something together ever since. In my usual fashion I initially declined, [Laughs.] realising that it would require twenty-two pages a month, but in the end I was able to do it and I had a lot of fun with it. It was done in a completely opposite manner to the slow, laborious way of doing European comics. It opened up a lot of possibilities to me artistically, that I didn’t think I was capable of. I discovered that I could have fun working quickly and taking short-cuts. PB: What about Battler Britton? CW: The link with that is more to [a previous project] Point Blank as it is for the same publisher (Wildstorm) and editor (Scott Dunbier). He got in touch towards the end of 2005 with the proposal of working with Garth Ennis, which would have been interesting regardless, as long as it wasn’t something like the Punisher. When I heard that it was a WWII story, in fact a WWII aviation story, I knew it was up my alley, but that it should be a revival of a British strip which I remember from my childhood was a great opportunity. One of the original artists on Battler, Ian Kennedy, was initially approached, but he’s quite old now, so it was passed on to me. I was a great fan of Kennedy back in the 60s and got a real charge when one of my first strips for 2000AD, in the early 80s, appeared in the same magazine as one of his. So this is something of my artistic tribute to what I have learnt from him, as the whole series is a tribute to the IPC war strips. PB: Given the unique position you occupy in the international comics industry the question that arises is whether it’s possible for others to follow your path, or has your experience been a one-off combination of being in the right place at the right time? CW: Of course it’s possible. You’ve got the language problems and all the other annoyances, but the European market is big enough that if you’re determined enough to overcome the obstacles there’s room there to succeed on many different levels. PB: Do you need to go over there and live? CW: I would think so, at least to begin with. It’s no big deal to do that. But you need to meet the industry half way. You have to realise that no matter how good you are you’re up against some pretty fierce competition. The standard is very high. You have a couple of universities turning out twenty to thirty graduates a year with a degree of comic creation of one sort or another. So you’ve got to convince editors that they should be investing in you. They won’t know your background, your reliability, your output. They aren’t going to want to make a commitment in you if you are going to disappear back to Australia, or wherever. You’ve got to be prepared to stay there for a time. For me, in the 1980s, that didn’t seem like a big comm-itment. I didn’t go over there deliberately planning to do it, but I’ve still found a small niche in the corner of the European market wherein I can work twenty-five years later. You can do anything if you’re determined enough. You've got to be believe in yourself; that you can do it. But it’s not going to happen overnight, you’ve got to be able to put in the time. PB: And you’ve surely got to be able to speak French. CW: It certainly would help. There are ways around it. PB: Having a partner that does; business or otherwise? CW: It worked for me. [Laughs.] I’m still amazed at how little cross-fertilisation goes on. It’s not just the language barrier, it’s the cultural difference as well. But there are some favourable signs. The deal between the successors to Les Humananoïdes, Los Humanos, and DC may lead to more interest in Americans working in Europe. CW: …and probably Dark Horse too. So inevitably I think you’re going to get younger artists having the realisation that I had when I first saw Jean Giraud’s work in the late 1970s; something along the lines of “I didn’t know you could do this in comics. I want to go and work over there”. Also reviews of Sure Shot Presents 1 “Crab Allan – Gothic Boogaloo” by L. Frank Weber “John Woo directs Tintin”, and Sure Shot Presents 2 Mandy Ord’s “Ordinary Eyeball” “[someone who is] developing into this country’s finest exponents of the graphic story”.